I have to admit—I love when my roles as both a mum and bridal stylist collide, especially in a way that’s majorly helpful to the masses. Prime example? When a bridesmaid gown (literally!) 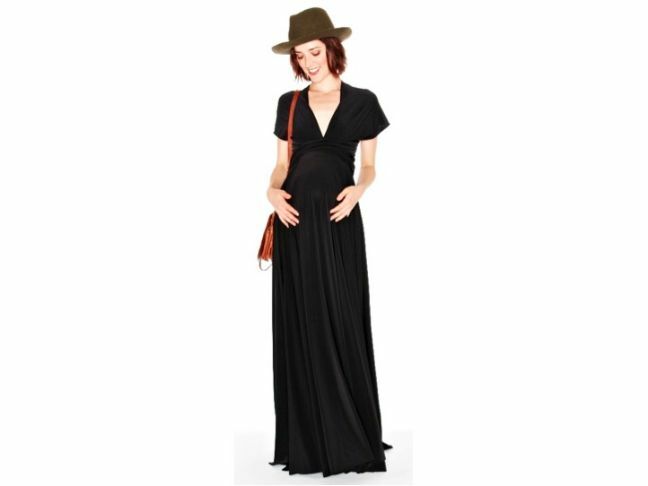 becomes my all-time favourite, wear-everywhere LBD (long black dress) for my pregnant friends and clients. You may have heard of twobirds as a brilliant idea for bridesmaids: one dress, wrapped over fifteen ways, to cater to every body type. But post-wedding, this convertible gown has gotten my girlfriends through their entire social calendar…and the fabric is so stretchy, yet supportive, that I wondered what would happen if we took a beautiful momma-to-be and dressed her through the seasons in a twobirds dress, while styling it with easy-to-find accessories. So we did. And the resulting outfits are amazing! Take a peek at the below shoot, as I re-wrapped a classic black twobirds gown for each season. 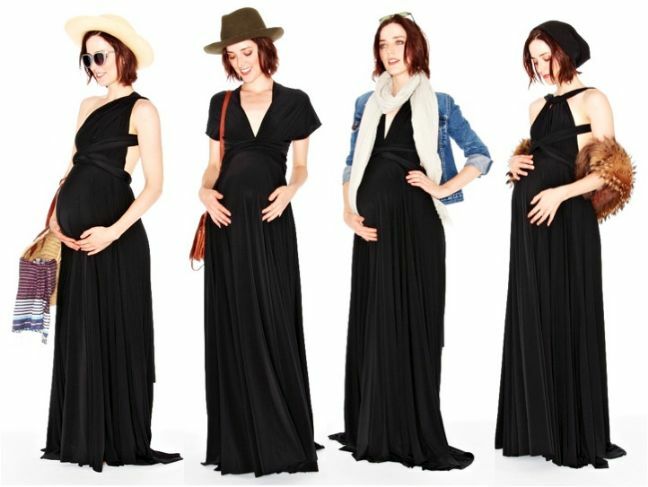 The looks made me realise just how phenomenal a black maternity dress really is throughout pregnancy. Take a peek! Here’s the classic black twobirds gown, wrapped for a wedding or other social occasion. It’s chic, polished, pretty, and oh-so bump friendly! Love! 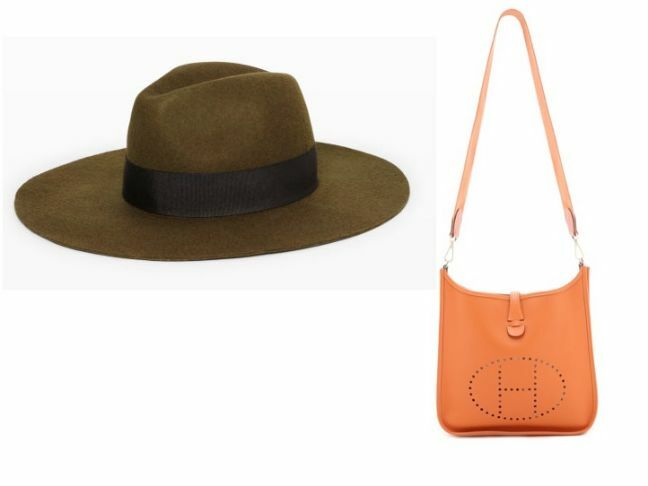 Since fall is upon us, we first paired the dress with a felt fedora and crossbody bag—two of the top trends of the season. If you haven’t yet jumped on the bandwagon, The Vancy Hat by Club Monaco, is similar to the one shown on our model, for $129.50. Of course, it pairs perfectly well with an Hermes Epsom Evelyne crossbody bag, but most of us aren’t so lucky to have that stacked in our closet…so the Rebecca Minkoff Ragan crossbody bag, $225, does the job just fine! Ready for winter? We rewrapped the black twobirds gown in a bust-supporting halter silhouette that added a little edge to the look. Once our model takes off her coat, she can continue to keep on her accessories. 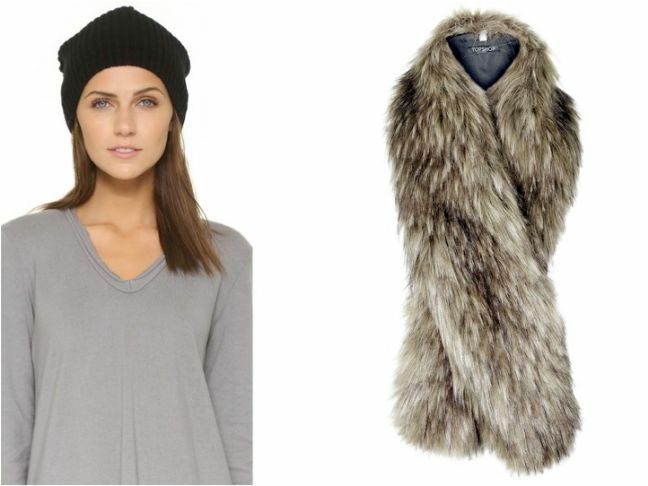 Adding a statement faux fur stole is always a good idea (I just love this Topshop version, $50), and 1717 Olive’s cashmere slouchy beanie hat, $120, puts a little downtown edge behind an otherwise formal look. Spring calls for lightweight layers that won’t overwhelm your look (nor make you overheat). I love DemyLee’s cashmere tissue scarf, $165, for this very reason. It’s a transitional season essential, so you won’t feel guilty splurging on the luxe cashmere feel, and it’s amazing for travel as well! 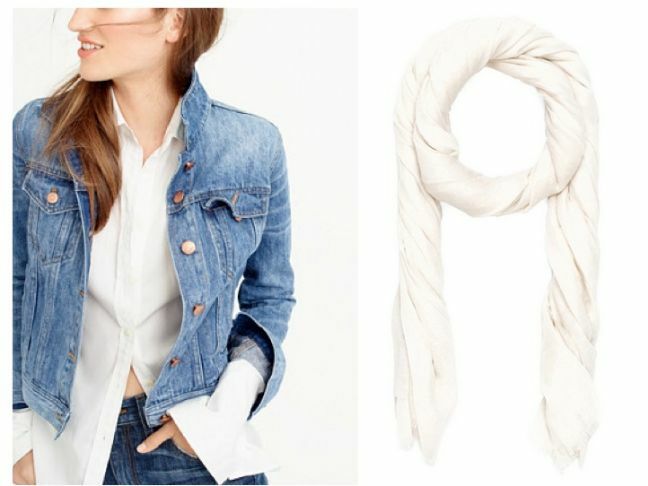 Of course, no woman’s wardrobe is complete without a classic denim jacket, and as I mentioned in this white dress rewear post, J. Crew’s denim jacket in the Taylor wash, $128, is hands-down the best on the market, bump or no bump! PS: If you’re about to head into your third trimester, you can add a bandeau to your twobirds convertible dress, to allow you to wrap the gown multiple ways while still getting the coverage and support you need! I was afraid it would look forced, but it was actually really fun to restyle this dress for summer (or that fast-approaching winter holiday)! Rewrapped into a supportive one-shoulder silhouette and worn with a classic raffia fedora, $104, by Hat Attack, the twobirds convertible dress is lightweight, fluid, and majorly beach-chic! We added a basic woven beach tote, but I also love the idea of mommies-to-be using a canvas utility bag for this look, as it’s also strong enough to double as a diaper-bag option for your post-pregnancy days! 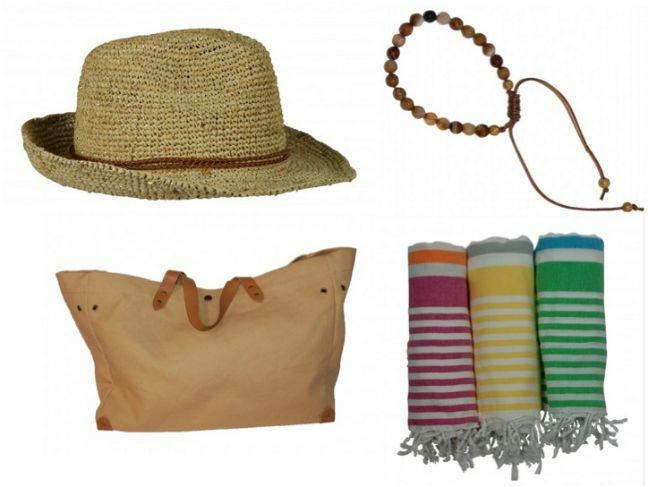 A $42 multi-colored striped beach throw and natural stone bracelets, both by Hat Attack, keep the look casually fun. Definitely make a mental note to add a long convertible twobirds gown to your maternity wardrobe—it’s an investment you won’t regret, before, during, or after pregnancy. 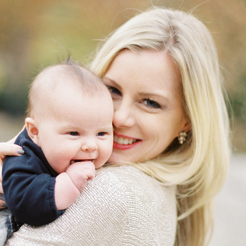 Jacqueline is a stylist, writer, creative consultant, and mumma to a toddler fashionista. She writes about style, décor and family life. After an extensive career in the fashion and design industry, in 2009, Jackie launched Merci New York, a boutique styling house and website. Her company creatively directs fashion campaigns and tends to the style dilemmas of NYC brides-to-be, but as a young mum, Jacqueline holds a sweet spot for the maternity, kid and chic-momma set. She is excited to see her bridal clientele returning for home design and maternity styling advice, and loves sharing style and décor tips with other new mums as she navigates family life as a city girl in suburbia. Jackie has been featured in GLAMOUR, The New York Times, Martha Stewart Weddings, Brides, The Knot, Page Six and Harper’s BAZAAR. She has appeared as a guest style expert on CBS’s morning shows, and has been quoted as an industry expert for Fox Business News. When she’s not styling models, mums and kiddos, Jackie loves travelling with her family and entertaining friends at home. Come chat with Jackie on Twitter, Facebook, Pinterest and Instagram.